“Rain” being metaphorical for “life’s troubles,” except in Louisiana, where rain means…well, water. More than 31″ in 15 hours. 6,900,000,000,000 gallons of rain in one week. Enough to wash your life away right before your very eyes. When my mother-in-law drove home last Friday evening, from the local art gallery, where she happily whiles away her retirement years painting with her varied assortment of colorful artist friends, it was indeed raining heavily outside. But, not enough to alarm or concern this 80 year old native of The Bayou State, whose extended family survived Hurricane Katrina almost 11 years ago. Trust me, people in Louisiana are not skittish about a little moisture. Yet, by the time she awoke early Saturday morning, a nearby river (a lazy young tributary that ordinarily meanders it’s way peacefully down to the Gulf of Mexico, many miles downstream) had overrun it’s banks and rudely entered her home without so much as an invite or an RSVP. Like a gang of unruly juvenile delinquents, it vandalized her entire life – snatching up framed family photographs and violently smashing them against walls, rearranging her decor by hurling large pieces of furniture into different rooms and toppling her refrigerator as though it were made of cardboard. Ironically, many of these homes, including my mother-in-law’s, provided haven for refugees of the disastrous Hurricane Katrina that devastated New Orleans in 2005. These very walls that offered succor to displaced friends, neighbors and relatives (in many cases outright strangers) were washed away in a matter of hours. 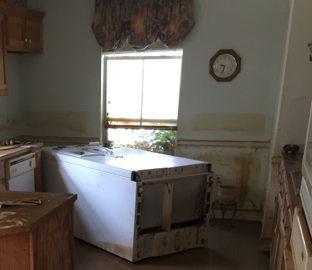 The true extent of the damage wasn’t realized by our family until several days later when “Mimi’s” children and grandchildren were able to get back into the home to survey the chaotic remnants of their collective childhoods. After several panicked hours of watching floodwaters rise around her, Mimi was rescued by a boat that, for better or worse, was able to glide right up to her doorstep. She was eventually taken to a shelter, where she says she has never been more touched by the depths of humanity and human compassion, as volunteers responded to and anticipated her every need. 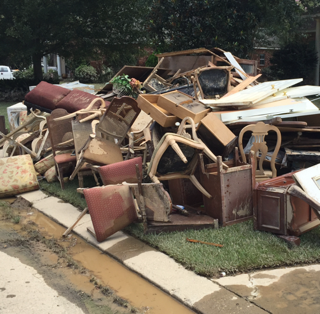 With the grace of God and a large dose of “can-do Cajun spirit,” almost everyone was saved over the course of the next two days, although 40,000 homes were destroyed in Livingston Parish alone. On Monday morning as the water went down and the sun came up, the journey to reclaim and re-tame Louisiana began. Local residents feel optimistic that, just as in post-Katrina, the fierce Acadian determination, combined with sheer American grit will prevail and South Louisiana will flourish once again. As for our Steel Magnolia, she’s grateful her children were able to salvage a few tangible memories of her past. She will start her new life with a few cherished photographs and her indomitable spirit intact. She has a long road ahead, but we know this thing hasn’t beaten her. Thank you for sharing. I was moved by your sentence ” she has never been more touched by the depths of humanity and human compassion”. It’s so good to hear of the goodness of humanity when we see nothing but the bad most of the time on the media. It was touching to hear her tell us about it. It restores our faith in humanity and we all need that to happen for us. Thank you so much for reading! will adjust to this terrible situation. Her children have been a great help. Thank you. She raised great kids!